It recently came to our attention that we've known Chris Lane for, well, years. 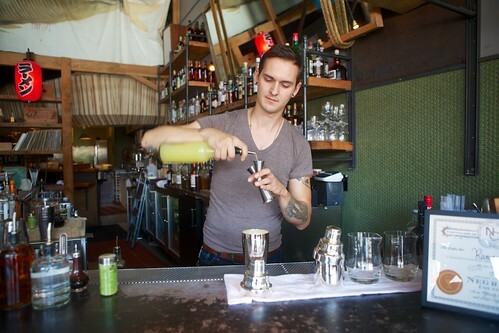 The early days of Heaven's Dog used to have what is now a bygone SF unicorn: $5 cocktails. Chris used to work at Heaven's Dog on Fridays, and as we'd while away the Friday evening, Chris would indulge us with crazy awesome cocktails of his own design, as well as an impressive list of classics and tiki (Scorpion please!). It may or may not have inspired Josh to even pen a blog post in the form of an ode to the Devil's Backbone, a deep, slow, and stirred Scotch drink that Chris eventually put on the Lolinda menu. Let's just say that the ode began with a Dante quote ("Abandon all hope ye who enters here!"). Though I have tried to find that post for publishing, it has mysteriously disappeared. 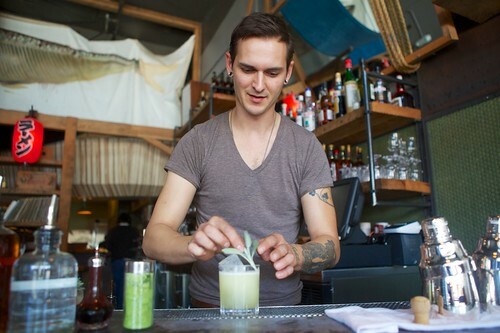 Today, Chris is heading up an ambitious cocktail program at Ramen Shop, a much celebrated restaurant in Rockridge Oakland that serves up rich bowls of ramen made with fresh California ingredients. It's a logical match for Chris, who has always embraced an impressive attention to detail and to execution with his cocktails. 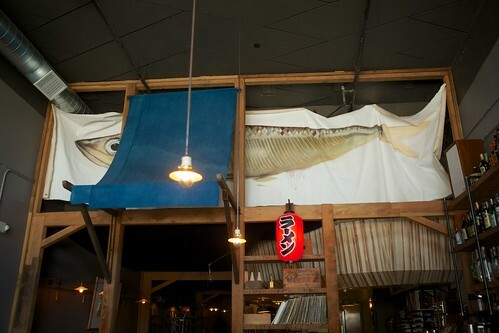 Ramen Shop is a great dinner stop. The now-famous noodles have caught the eye of Bay Area hipsters and foodies, and waits can be expected, as is typical for a hotspot. 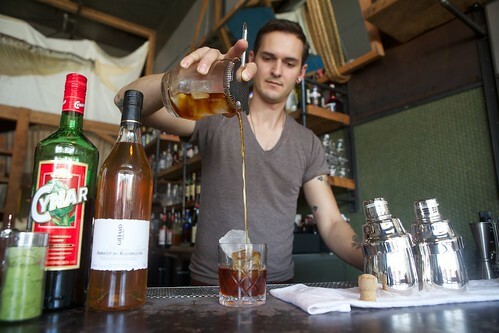 The bar until now has served as a happy landing pad where patrons can wait for tables with glass in hand. There may be even more room for the bar in the future when the restaurant expands early next year and brings more tables and dedicated bar space. 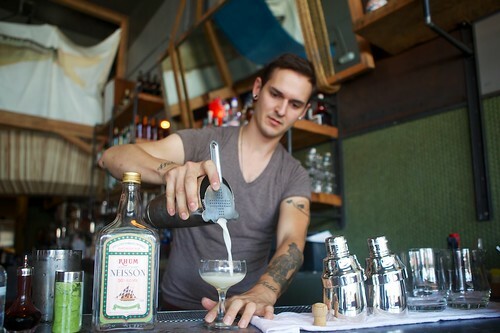 The cocktail menu itself is a great amalgamation of Chris's style, combining classic presentation, tiki- and Japanese-style ingredients, and precise execution. If the range seems impressively wide, it is—only made more admirable that this represents a mere slice of Chris's spectrum, with cocktails chosen specifically with the food in mind. For Chris, this meant cocktails that were a bit more savory and a bit lighter. Want to meet the cocktails? Double Barrel Fizz: Rittenhouse Rye whiskey, fresh lemon juice, cherry gastrique (a sweet and sour syrup), cinnamon, with a float of Rodenbach Grand Cru, served long over ice in a tall collins glass. 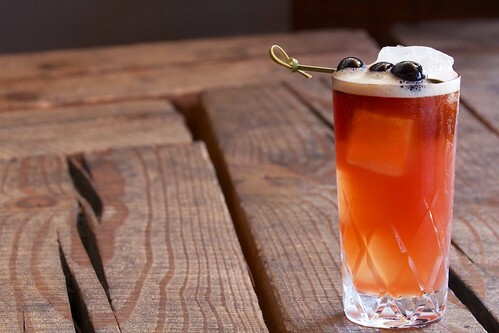 Though we are often suspicious of beer cocktails, this is one that works beautifully. The Grand Cru brings a nice funk to the lemon and cherry tang, and the cinnamon takes the spice to the end with a nice finish. It's at once tangy and savory, which makes it a good addition to a meal. Old Golden Cocktail: Fidencio Clasica Mezcal, lemon, honey, ginger, crushed sage, served over ice in a rocks glass. 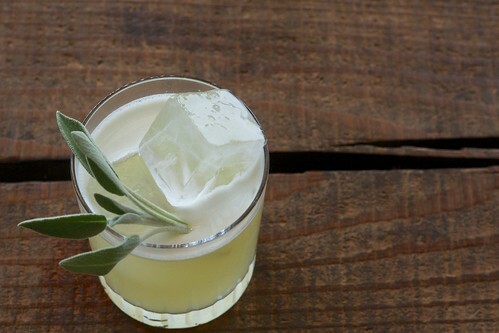 A refreshing drink in which the smokey mezcal and sage combine seamlessly into a light herbaceousness with a honey finish. 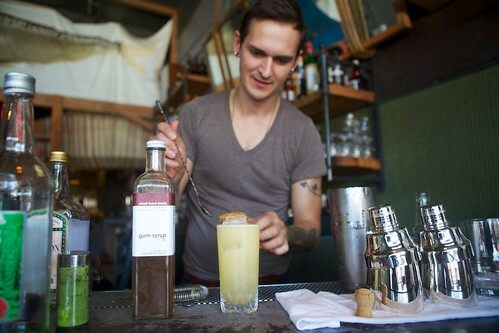 The ginger is subtle and not overpowering, a common downfall for many Asian-inspired drinks. But not this one! First and Last: Neisson Blanc agricole rhum, lime, pineapple gum, Velvet Falernum, Sapins Traditional. Texture is one of the cruxes of this light and fluffy drink, whipped up purely from pineapple gum syrup and precise shaking. It require fast shaking to create the meringue without introducing too much water, so an expert hand is required. 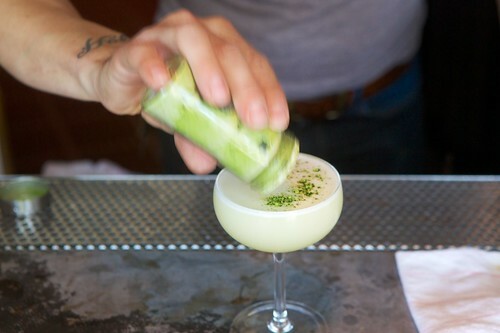 The result is a smooth, almost creamy, and approachable drink, that washes pleasantly over your palate. The agricole rhum and pineapple together create a delicate profile made from tiki ingredients with classic presentation using Japanese execution. Truly a testament to Chris's range, this felt like one of his program's signatures. Big Medicine: Herencio Blanco, lime, Bergamot, orange marmalade, gomme (sugar) syrup, and tonic, served long, over ice in a tall collins glass. 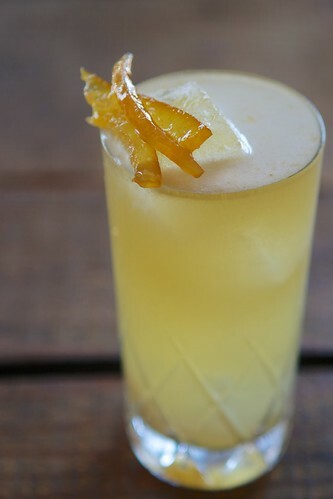 We love cocktails that introduce marmalade because of the richness bartenders are able to achieve with it. Big Medicine is a very good example of it. 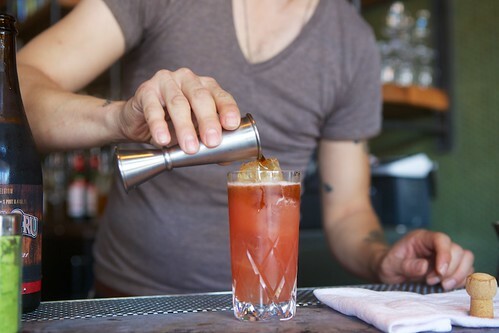 Chris introduces a little bit of salt into this long cocktail which turns it savory. The saline tempers the sweetness in the marmalade and pleasantly accentuates the bitter rind and the tonic. The lime and orange taste like natural companions to the tonic and, served long, tastes like a pleasant, highly sippable, distant relative to a classic gin and tonic. Broken Flower: El Tesoro Reposado tequila, Cynar (artichoke Italian bitters), fresh lime juice, fresh grapefruit juice, cinnamon, Angostura bitters served up in a coupe glass. The grapefruit and Cynar come together to create a satisfyingly bitter and rich drink that is at the same time refreshing. 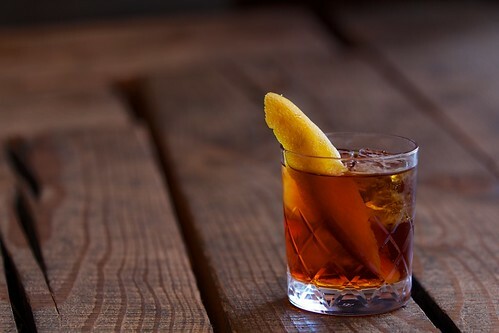 You'll find spicy notes from the tequila, Cynar, cinnamon, and Angostura, reminiscent of some tiki styles, but with a light texture and restrained sweetness. It tastes crisp, almost like an apple. Drop Point: Rittenhouse rye whiskey, Amaro Nordini (Italian bitter liqueur), Cynar (artichoke Italian bitter liqueur), and apricot, served on the rocks in an old fashioned glass and garnished with a large orange peel. This is a stirred drink that is more crisp and refreshing than it looks. 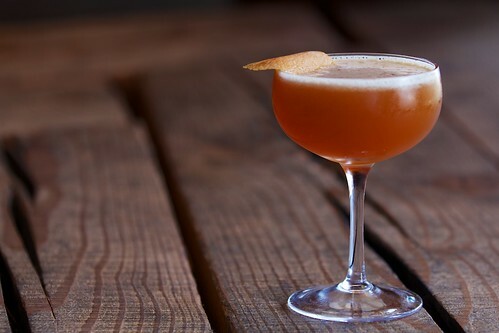 Though it is one of the slower sippers on the menu, the apricot uplifts the cocktail in the end and brings together what would otherwise be very serious, bitter, and slow ingredients. 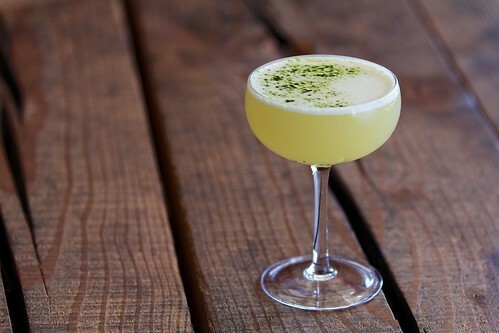 Grass Cutter: St. George Spirits Shochu, terroir gin, fresh lemon guide, ginger, vanilla, orgeat (almond syrup), pineapple, matcha powder, served up in a couple glass. Along with the First and Last, this is felt like another one of Chris's signature drinks on the menu and one that most explicitly incorporates Japanese ingredients along with some tiki influences. 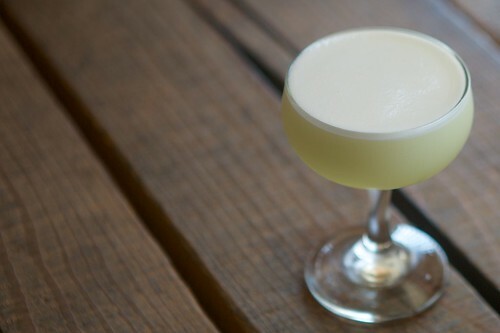 It's a light and airy cocktail that is, like the First and Last, texture-driven with high attention to execution. Though some of the ingredients might feel foreign to some drinkers, the result is something strangely familiar, almost like an adult version of your favorite birthday cake. 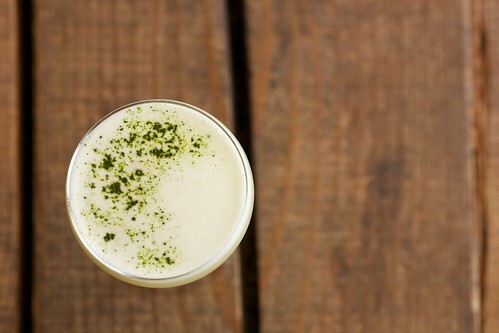 The matcha introduces some salt and dryness to the cocktail and contributes to an overall profile that is not cloying. You won't find a cocktail like this anywhere else in the city. There’s about a million hangover “cures” in the market right now and I’ve tried a lot of them. The most effective one for me is Detoxicated, my friends have tried it and feel the same. Here’s a link to the page where I bought it. I also got to know about best hangover cure that works from their website.